As a prospective graduate student, I have been exploring the intersections of society, media, technology & behavior change. The potential projects and digital tools presented on this webpage are informed by my self-directed research and exploration. 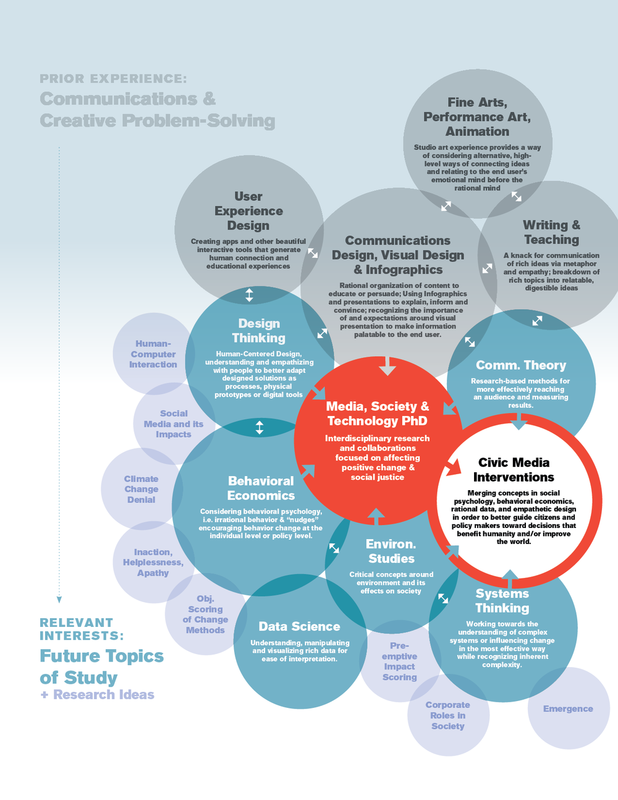 Translating real-world skills and experiences into research interests. Are we blind to new ideas due to our confidence in well-worn approaches? Perhaps a simple tool can stimulate new pathways and aid brainstorming by radically broadening our perspective early in a project. Even if it's an exercise in broadening for its own sake, I think it could be a useful approach in A) admitting that we have comfort zones, B) admitting that there are useful ideas outside of them, and C) that we need help in getting there. Approach: An app that produces a slot-machine style remixing of constructs, for instance, three slots: problems, methods, and tools. For context, seeing a common problem such as drooping web sales through this lens would look like: Problem: Web sales | Method: Incentives | Tool: Email. The solution from this combination is "abandoned cart" reminder emails. 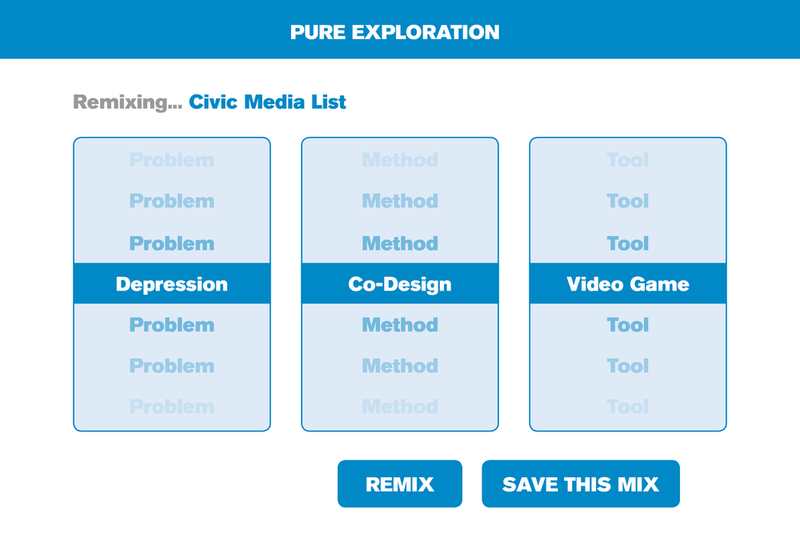 So... Can we work with people who suffer with depression to understand their plight, combine that with what we know from research, and co-design a video game that battles depression or alleviates some symptoms? Maybe. Maybe not. Do these ideas produce real solutions, or simply inspire other ideas? At what point is this more valuable than staring at a blank page? I don't believe for a moment that this tool would be a concrete answer to any complex problems. I imagine it would be useful for kicking off new projects, playful experimentation in early stage research approaches, or simply brainstorming with a group. I think that we can surprise ourselves if we simply admit that we don't love changing our approach, and we can add a bit of delight to our design processes while we're at it. With more delight comes more interest, and the hard work of design can become inherently more sustainable. Lastly, it seems that the moment of 'inspiration' is really valuable to us, but that makes sense. I'd question whether relying on that creative instinct is always the right move. How can we help each other choose to stay in the present moment while not abandoning our social media identities?Our connected lives are making it harder for us to focus when we're together in-person. With a tool that pays attention to our behavior trends, we can combat this together. Approach: An app that riffs on 'phone stacking' by using proximity, NFC, or mutual request to lock the phones of any two users, or a group of users. While locked, the app generates an away message, tracks connected time, and awards users with a leaderboard and unique visual artifacts generated from in-person time. The app is unlocked by mutual request or breaking proximity. 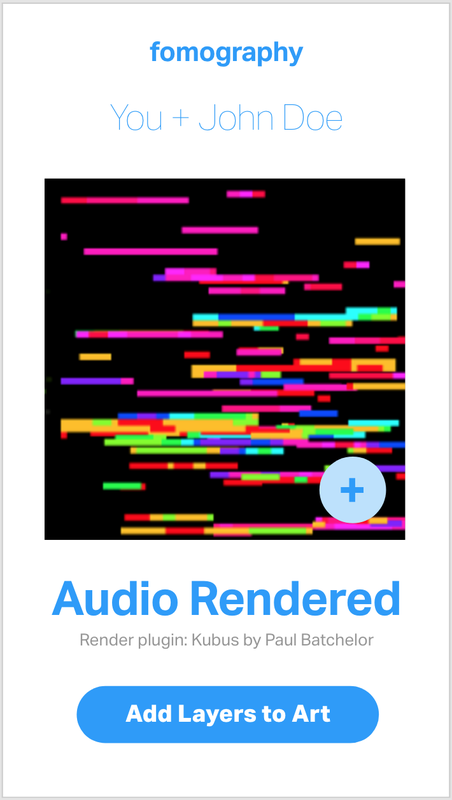 A screen grab from the wireframes, showing the option to render an audio-driven artwork from a shared conversation's audio waveform. Click image to launch fullscreen demo. Abstract: FOMO, among other internet-related crises, is a challenge for our psychology, especially for those who grew up in a connected life. Studies show that cultivating and maintaining an online persona is part of our culture. Simultaneously, the world's best engineers are constantly A/B testing us in a battle for our undivided attention. As connected devices and services proliferate, we can only assume our attention deficit will scale with them. This app not only makes it easier to create space from devices by using a mutually guaranteed self-protective protocol, but talks to social media platforms to announce to these networks that the user is engaged in real life, or 'IRL' in internet slang. These in-person, undistracted engagements earn points and feed into a leaderboard of other app users. As a method of making this more of an incentive than disincentive, the app takes sound samples from the time users are logging together. These sound samples are used to generate visual snapshots, artistic interpretations of the waveforms. Loud rooms or a party would generate an energetic looking digital painting. Time in a park with a quiet conversation would reflect this environment visually, too. These digital artifacts may be posted to the user's social media accounts to again reinforce their digital persona with their more valuable IRL persona, creating an incentive to share and reinforce others' desire to hang out IRL and share intimate, vulnerable, and/or authentic experiences that are much less likely in a 'second-identity' online scenario. Can we help overcome statistical numbing by using better numerical metaphors or analogies? From taking action against climate change to asking for donations to important causes, statistical numbing creates real problems in civic action. When statistics feel overwhelming, humans have a hard time maintaining an emotional connection to indirect, systemic threats. Approach: Convert overwhelming statistics into ratios that we are more familiar with to circumvent psychological short-circuiting. In other words, use analogies to make powerful stats relatable and encourage more of an emotional response. Contrast this with the idea that the typical citizen has a great sense of what a blowout pro sports game looks like. We can quickly assign an emotional weight to these; they are anchored. If I told you the Super Bowl was won by two touchdowns (with extra points), a score of 35 to 21, you wouldn't bat an eye. If I told you the game was won by forty-five touchdowns, with a final score of 322 to 7, you might react differently. In Europe, a soccer score of 12 goals to an opponent's 3 goals would really resonate because goals are so much rarer in soccer. I'm interested in playing with the anchored sense of scores to translate that into impactful stats. I would be interested to see how this changes with scores that are beyond the realm of possibility vs. scores that are total blowouts. I suspect that scores blown too far out of proportion may lose efficacy. There would likely be a range of acceptable exaggeration. This would be interesting to investigate this as a way of presenting facts differently in the media, perhaps even developing a reliable toolkit for citizens who wish to stay aware. Sports scores are only an initial idea; I could imagine a scenario where ratios and values are established in a platform which allows users to choose their own metaphor.